How to get there: From Stanford University (it is obvious how to make this San Franciso or San Jose), take 280 south to 85, then 85 further south to 101. Drive 95 miles (153 km) south on 101 from the point where 85 and 101 merge. Look for Jolon Rd. exit. This is just north of King City. Exit here and measure from the stop sign. Turn right onto Jolon road, go straight by a Chevron gas station and continue this road for 18.4 miles (29.6 km). Now watch for a road going right (as Jolon road curves left). This road is called Mission Road. 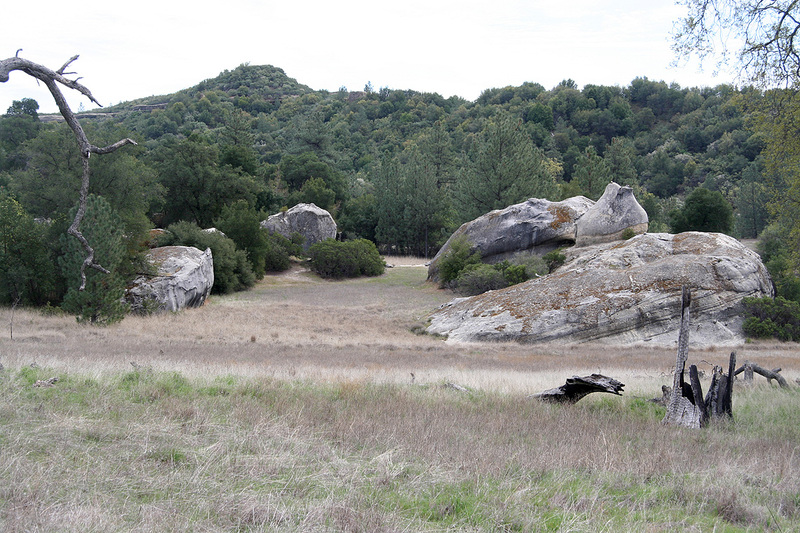 There is a very visible marker saying "US Army, Fort Hunter Liggett". Turn right onto this road. There is a military gate at mile 18.6 (29.9 km), the guard will ask you for your driver licence, vehicle registration and proof of insurance. The guard may also warn you about frequent radar checking of speed on the road ahead. Continue to mile 23.4 (37.7 km), turn left here on Del Venturi Road. There is a sign here saying Santa Lucia Memorial Park. There are a couple of left going roads before this one, but this is the first intersection where there also is a road going right. You have driven by an area with lots of military trucks before getting to this point. Almost immediately (mile 23.9, km 38.5), you cross a river on a concrete section, there is no bridge. The water is likely not too deep or they will close off the road. At mile 24.2 (km 38.9), the road forks, stay right. At mile 31.1 (km 50), you cross a river again in a similar fashion. 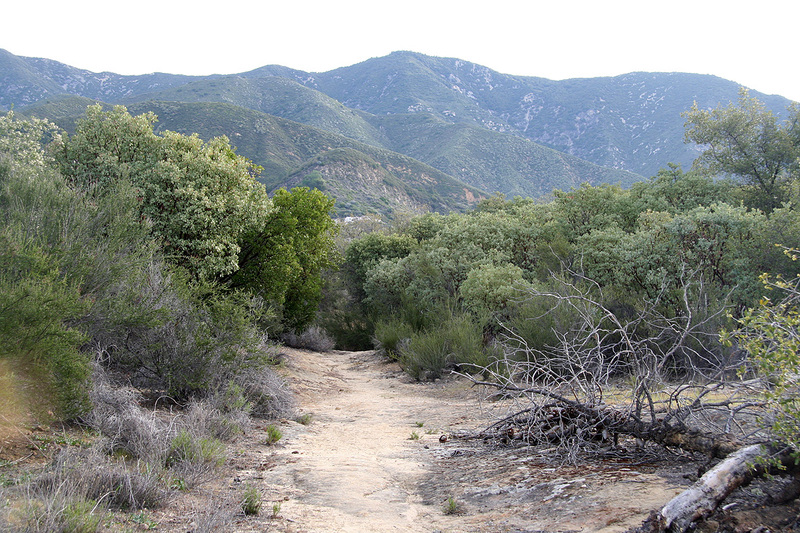 At mile 35.7 (km 57.4) you enter Los Padres National Forest. Continue to mile 40.9 (km 65.8), look for a small dirt road going right and a small sign saying "Trail". Turn right onto this small road and drive carefully just a few meter to an area where you can park. There is a fence and a gate as well as several signs with information. 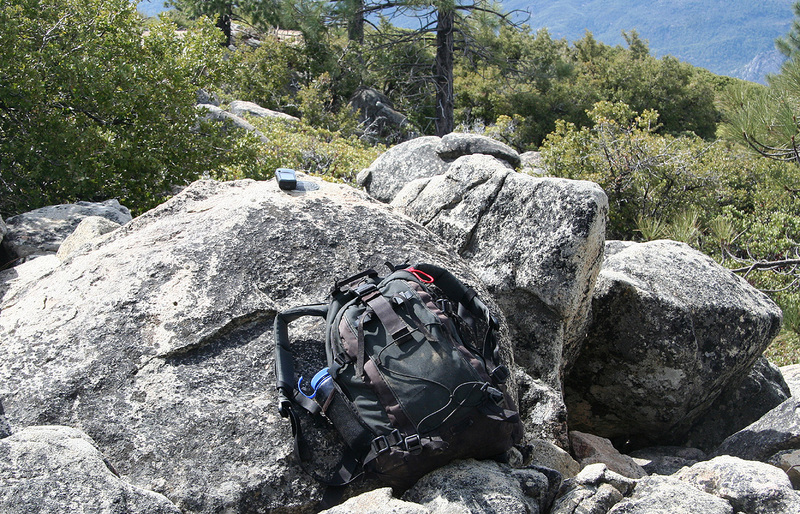 This is the trailhead, location N36:07.029, W121:27.754, elevation 650 meter. 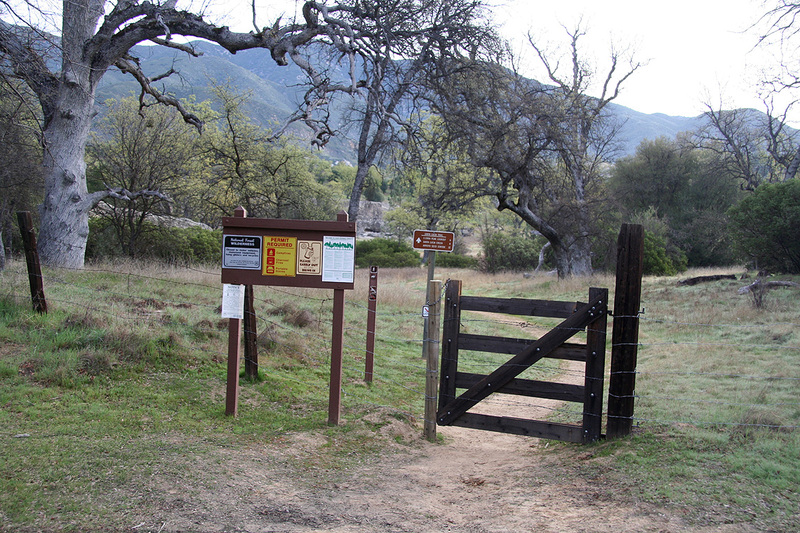 Route description: Walk through the gate, descend to and cross a small creek then enter an open field. The trail forks and the most visible trail forks right. Do not follow this, but proceed straight ahead on a somewhat fainter trail, see picture below. 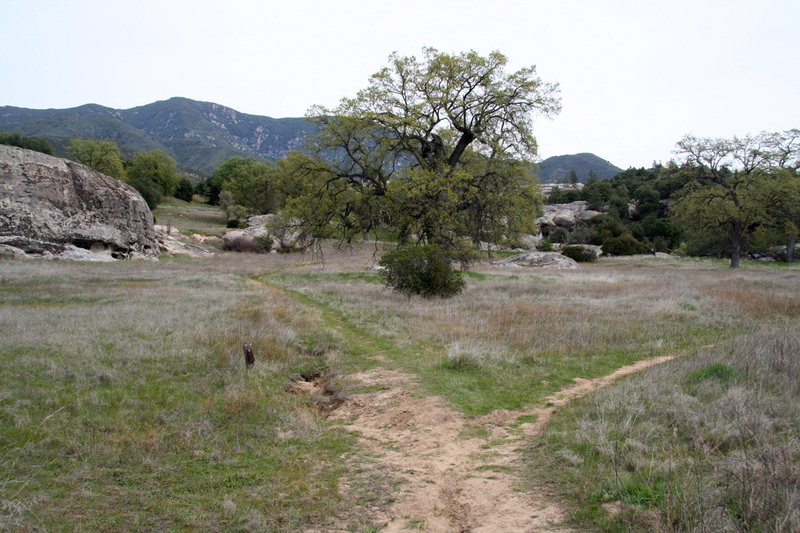 This trail climbs gently near an interesting rock formation, then levels out. The trail is now very clear and easy to follow. The trail will first take you to a small local saddle, then descend slightly into a new small valley. The terrain is very pleasant, scattered trees and grass. The trail curves left and enters a small valley that we will follow as it climbs higher. First gently, then steeper and the trail needs to zig-zag in order to gain elevation. There is a trail sign just before the terrain gets steeper saying that you have 4 more miles to go. This sign is a bit conservative, in reality you have covered a bit more than 1/3 of the way. The trail will gain a col and you can see further north for the first time. There is another sign here and a trail fork. Take the right forking trail and continue up along the ridge that climbs right towards the summit. 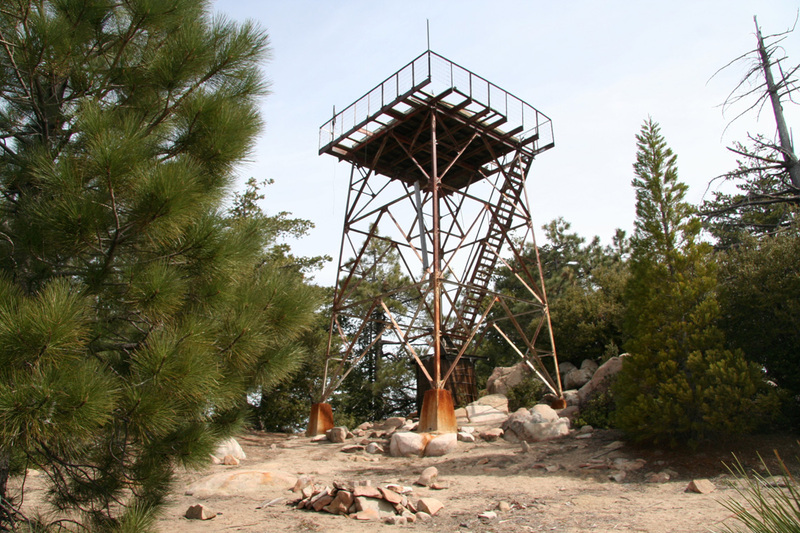 Soon, you may see the lookout tower near the summit, however, it is a bit further than it looks. As you cross the north-west ridge, the vegetation changes character. On this side there are big trees. Until now, the trail has been dominated by brush, including poisson oak. Continue until you top out near the lookout tower. The summit consists of two small humps and the USGS benchmark is located on the next hump over (further east). Most likely, this is the highest point. Comments: However, there are some large boulders near the lookout tower and my GPS measurements were not able to tell which point were highest, reading 1774 meter in both locations. My GPS read 1783, that is 9 meter higher on top of the lookout tower, this makes sense as the tower had 39 steps. The summit official elevation of 1787 meter is surprising given the very good reception (accuracy reported at 2 meter) of my GPS. I have not observed a 13 meter difference between GPS and official maps anywhere else, so there may be reason to have a review of this data. I left Stanford University around 0445 in the morning and started hiking at 0815. The sign saying 4 more miles was passed at 0915 and the summit reached at 1045. I spent a full 45 minutes at the top, exploring the area quite carefully. The return hike took 1:45 and the drive back to Stanford, 3 hours. The trail was nice, but could see more use. I saw one other hiker, a man that I caught up with after about 30 minutes, I also met him near the top during my descent. The next day had a somewhat miserable weatherforecast, however an early morning trip to Loma Prieta turned very successful. The trail with Junipero Sierra ahead. 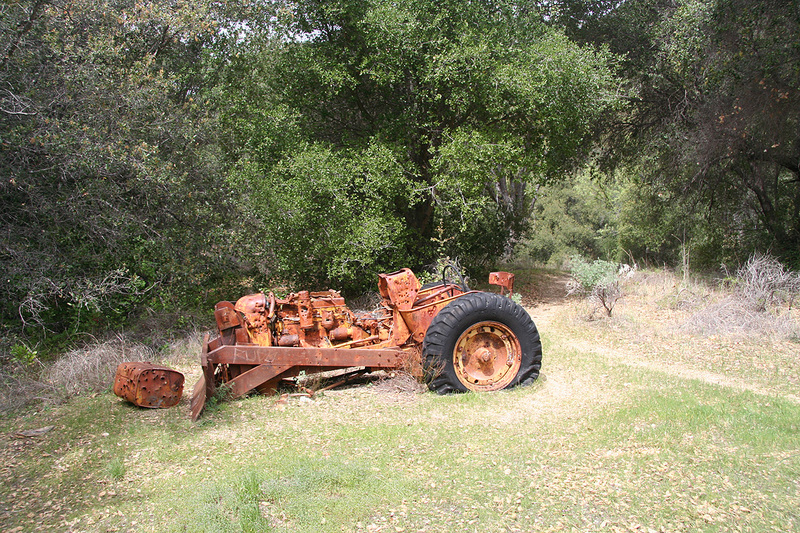 This tractor has seen better days. The summit rock that holds the USGS benchmark marker. Summit Panorama I. The view is south to west. Summit Panorama II. The view is west to north. Summit Panorama III. The view is east. Summit Panorama IV. The view is south. Panorama V. The view is north-east. The picture is taken from the trail a bit below the summit.